Big Stuff BBQ serves barbecue to make a Texan happy: beef, ribs, chicken, and homemade sausage, of course, but also turkey and ham. Add some of the tastiest side dishes and you're guaranteed a great meal. It's the finest and most genuine barbecue in the Northwest, so if you're looking for a taste of comfort, Big Stuff would love to welcome you home. 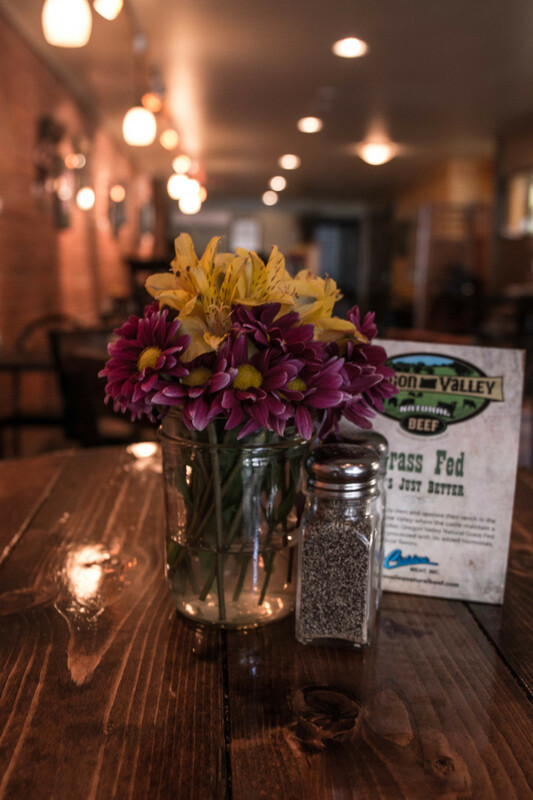 Named after Joseph Frank "Buster" Keaton, an American actor, vaudevillian, comedian, filmmaker, stunt performer, and writer, this famous cafe is located alongside the historic Cottage Grove Hotel. Buster's Main Street Cafe provides a warm environment coupled with great food. Enjoy Eggs Benedict, a Salmon Omelette, Steak and Eggs, Philly Cheesesteaks, Reubens, Monte Cristo sandwiches and more. It's time for a fiesta! With a wide selection of authentic Mexican food, huge portions, and great service, El Tapatio has become a local favorite. Customers love the guacamole made fresh at the table and the "kids eat free" Sunday special! Jack Sprats is dedicated to providing an excellent dining experience that comes with a great meal at a reasonable price. Located in Historic Downtown Cottage Grove, Oregon, Jack Sprats features local artists, talent, and musicians. With a great menu that can provide comfort food for diverse diets, the food ranges from American Traditional to Gluten-Free and Vegan. Jack Sprats strives to provide food and an environment that can allow everyone to enjoy the experience so bring along your kids, too! Mangiano's is a famliy owned Italian restaurant in Cottage Grove. Providing video poker, the Pac 12 Network, and the largest salad bar in town! If you enjoy handmade, light crusted pizza with delicious baked toppings, this is the place for you. Be sure to make it a stop on your list because you won't want to miss out on all the cheesy goodness. Check out the taco pizza if you want to try something new. The staff is welcoming and the chunky salsa is great. Food will come quick and it's always fresh, hot, and delicious! Children will love the family-friendly atmosphere and it's guaranteed you'll want to come back again. The "Seasons at the Green" restaurant at the Village Green Resort is the perfect location for your next date night, known especially for its amazing prime rib. Be sure to stop by every evening for live entertainment in the lounge at Village Green Resort and Gardens. The diverse entertainment calendar offers something for everyone from acoustic solos to folk and from karaoke to rock. Fresh, vital food made from scratch that is delicious and served hot and fresh. Backstage Bakery & Cafe provides wonderful baked goods made daily and fresh pizza. If you're in the mood for something sweet, make sure you try the cinnamon rolls! Try it early in your visit because you'll want to come back for more. Stop by for a huge meal in a quirky ambiance. The Pink House offers a large menu with traditional American food as well as Barbecue. Try a classic cheeseburger with fresh-cut french fries! With great service and large portions, you'll want to come to Stacey's eager and hungry. Don't worry, if you're looking for something light, there's a small plate menu to go along with it. Good luck finding a prime rib dinner with a salad, veggie, baked potato, coffee, and an ice cream sundae for $16.00. It can't top the quality and satisfaction of Stacy's!